Feeling tired? Feeling lethargic? Reach for a glass of healthy fresh juice to PERK UP YOUR ENERGY. 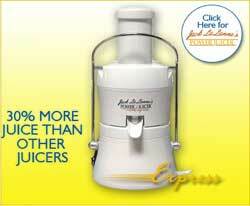 With Jack LaLanne’s Power Juicer Express, you can make that glass of juice a lot FASTER and EASIER. The large chute allows you to drop in whole fruits and vegetables, no chopping or slicing. Less MESS and EASY CLEAN UP with the drip free spout and large tight fit pulp catcher. It is more compact and takes up less counter space than traditional juicers. Our heavy duty 3600 RPM motor and surgical steel quality blades deliver 30 % more juice than other juicers. And the best part is you get a LIFETIME GUARANTEE on the motor!